I’ve learned a lot about myself the past few years but recently I’ve been focusing my memory on why it might be that I dislike trash so much. My mother and I figured that we both have always been taught that litter is bad and we humans need to do our best to keep from letting our waste escape captivity. I remember seeing the famous commercials from the 1970s with Iron Eyes Cody, the Native American that was portrayed as crying as he saw so much garbage disturbing beautiful natural scenery. My mother and I really sympathized with that message and think that may have played a role in my dislike of litter. Recently I’ve been thinking about my Papa Frith. He was a cattle farmer and had plenty of land to survey every day. I used to ride around with him and remember that we would often stop to pick up glass bottles, cans and metal from his pastures and roadsides. This was before recycling became mainstream, people were just expected to return stuff they used. Of course, my grandfather was a businessman first — this was a paying gig. Back then, you could get $.05 from stores for returning a bottle and he would take the cans and metal to whomever would pay him for what he recycled. 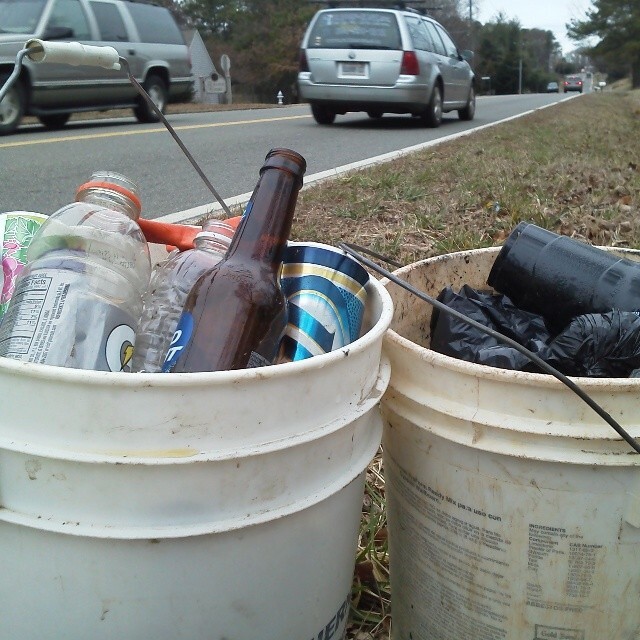 Occasionally when I have 10 minutes to spare, I’ll stop somewhere and pick up roadside trash. Sometimes I’ll pick up trash in a park, on a sidewalk, from a ditch, a creek…wherever I happen to be when the mood strikes me. Ten minutes is just long enough to make a difference and not long enough to make it a burden. Now that I’m a father, I’ve tried to pass on this dislike of garbage to my children. We’ve had them going on organized volunteer park cleanups for a long time and we’ve done plenty of hikes with a bucket looking for trash. I love that they don’t see this exercise as a chore — we act like we’re looking for treasure and take a lot of pride in finding the most, finding the worst, cleaning up the biggest stash of trash — all in the name of fun.